Pay Compliment Blog | What can we learn from Marie Kondo (and Josh Bersin) when it comes to HR Tech? ← How can Organisational Network Analytics help small to medium organisations with culture? Best selling author Marie Kondo has been inspiring the decluttering of homes far and wide with her Konmari methods and her new Netflix series called “Tidying up with Marie Kondo”. At work we might take some lessons in decluttering too. You see technology is just like kitchen accessories, clothes and belongings. It has a habit of proliferating. This phenomenon has been getting worse since the era of cloud software, turned on in an instant rather than under stewardship of an IT department. When your HR technology list is bulging at the seams it's time to look at streamlining things. You might start by looking at duplication. Do you have multiple platforms for the same function in different areas of the business? We see this often with survey tools where each type of survey in a business is being run through a different platform, each one adding cost and complexity for no good reason. Another common area of duplication is goal tracking where individual departments might each be using their own system. Yet another common area of duplication is learning platforms where access to learning content might have led to various platforms being used rather than a central one. Duplication is caused through the evolution of your HR Tech rather than making specific design decisions. New systems are added because of unfulfilled needs, but seldom is the question asked: “by adding this new system which old systems can be retired?”. Of course, it takes work, costs money and involves change to simplify your HR Tech. Once you have identified duplication, actual change might be triggered by a compelling event like the last system expert leaving, the next round of goals becoming due, the expiry of a licence or subscription, or time for another survey. The next thing to look at is if you have software that only performs a single narrow process. This is like stuffing your kitchen draws with the cherry pitter, the strawberry huller, the apple corer, the oyster knife, the fish scaler (yes I did just go to my kitchen drawer for reference). Pretty soon the drawer is overflowing with tools that serve only one purpose and that you hardly ever use. A good knife, that could be put to use every day would work perfectly well to replace all of the above. Technology startups and their apps are culprits of uni-tool creation. They come to market with minimum viable products that offer a shiny new thing generally around a single pain point. If your metaphorical HR drawer is stuffed full of uni-tools it’s probably time for a clear out. To do that aim to acquire platforms with a number of capabilities instead of applications with just one. 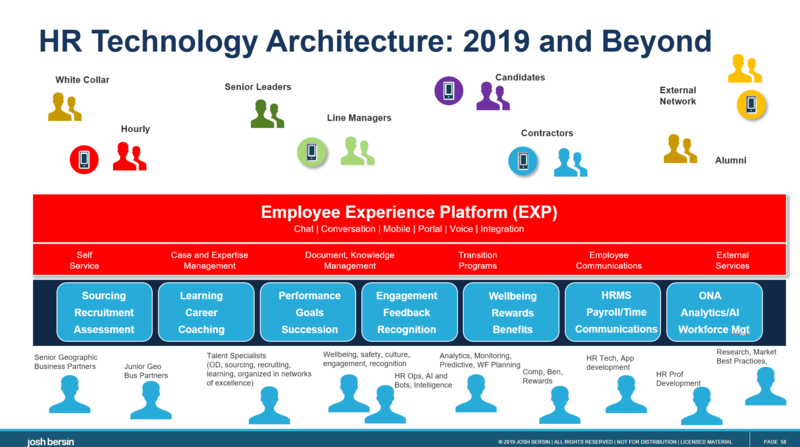 Josh Bersin recently highlighted the emerging software category of employee experience platforms (EXP's) and included a handy HR Technology architecture that can be used as a blueprint for decluttering and acquiring multi-purpose platforms. If you can start migrating from uni-tools to EXP platforms you will not only declutter your HR Technology footprint but will create a simplified employee experience that removes overwhelm. At Pay Compliment when we started out 4 years ago we’ve been the startup providing the uni-tool. We set up simply as a real-time feedback platform. (feature set 1 within the employee experience platform architecture). Since then we’ve broadened our horizons to offer 9 modes of employee connection, each as a range of online forms, free format text, video, audio and chat. The numbered feature sets on this version of the HR Technology Architecture show how the Pay Compliment platform has evolved over time. These 9 modes are very effective for employee listening, feedback (1), performance management (2) , engagement, exit and stay interviews (1), and wellbeing and rewards, which in our case are intrinsic (5). All of that data and the nature of the interaction is a useful source of analytics that we mine with both ONA, Data Warehouse, and Cognitive Services (3). We’ve then recognised that observing and narrating performance and growth is only part of the whole employee experience. To truly empower each worker to do their best work every day we have now added directed and self-directed micro-learning (4) with a feature set that provides a public curated learning library and learning content, together with a private library and content management system for customer specific learning. By connecting micro-learning to performance management and engagement communication we can now offer a single platform for individual and organisation wide growth that delivers a seamless employee experience. We believe we have a platform that will help you deduplicate, and ditch the uni-tools to become simpler and more powerful in developing your people. As Marie Kondo says “There are 2 reasons we can’t let go: an attachment to the past or a fear for the future”. Which is holding you back? Call us to spring clean your approach to connecting with your people.